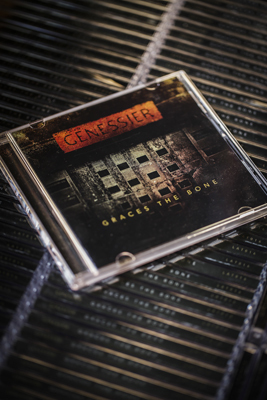 Genessier is bringing back the horror industrial vibe in a huge way. Think Skinny Puppy but even scarier. 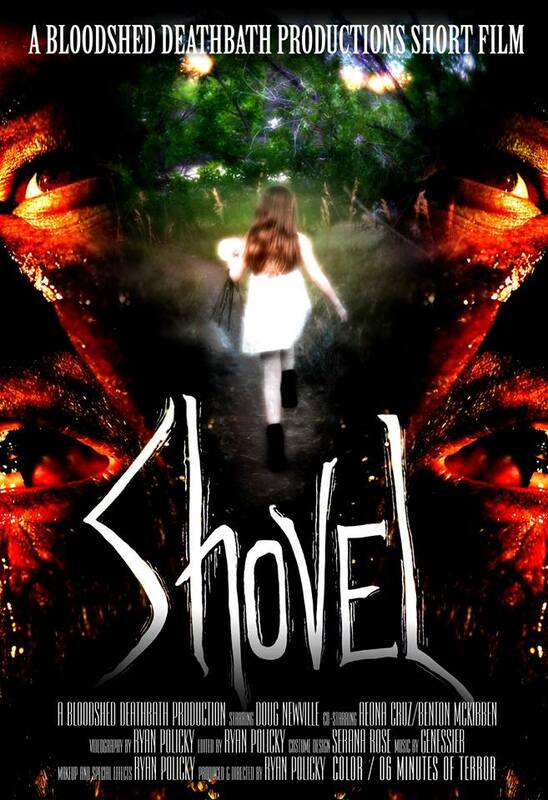 Here’s their chat with HMM about their tunes, videos and a new short horror film they composed the soundtrack for called Shovel. What, who and why is a Genessier? Genessier is the doctor from Eyes Without a Face. A classic French psychological horror film by Georges Franju, It was the perfect representation of what we were making with this dark, haunted industrial sound. A grotesque and horrible nightmare hidden behind layers of bandage. An experiment on what we had made musically in the past, re-formed into something completely opposite. Eddie Breidenbach and myself were creating layers of dreamy material in a project just a few years previously named “The Parallel Light”. It was music that was made to fall asleep to. Well, Genessier is music that was tailored to do quite the opposite. It was created to make people wake up and hide in the corner. 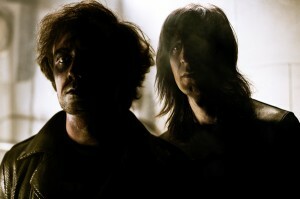 Your debut album Graces the Bone is considered by many to be the rebirth of horror industrial. How weird and scary was it writing the album and putting the whole thing together? I personally had this desire to make something that rekindled my love of haunted houses, and the first generation of industrial music from the past. I frequented venues back in the day that were in parts of town with minimal light, hidden in industrial buildings that looked more like places to get slaughtered than to go and have a good time in. I was/and still am a horror fanatic, working as an actor in haunted houses such as “Brutal Planet”. The visions from those experiences reared their ugly heads and demanded that we try to make them into sounds that could inspire a whole new era of haunted house making. When I approached Eddie about the idea he instantly was wanting to be a part of it. It was totally new territory for him, and a great way for him to try out all these new synths he had been collecting. We drove around collecting field recordings late at night and pushing buttons on new and old devices to create anything we thought could either scare the hell out of someone or at least make them fear going down in their basements again. There’s obviously some early Skinny Puppy influences in there. Did you pull from any other artists to get the vibe and feel of Graces the Bone? Early Skinny Puppy was some of my favorite horror music go-to, but yeah some other influences for sure took part of the thought process. Delia Derbyshire, one of the early pioneers of electronic music had this wonderful track titled “Falling” that haunts me every time I listen to it, and that for sure had a great impact in what we created. It’s the spacial elements that really set the horror in place. Creating a sound that feels as if it’s coming from beneath your feet, in the recesses of a dark dingy cellar. The reverb. The tone, the muffling of the floorboards. These were all the elements we focused on. Lyrically what are you going after? Are there any subjects that are taboo for you? The lyrics we delve into gravitate towards painting a dark and brooding nightmare world. Some of the tracks hitting more of a fictitious theme with some tackling issues of relationships gone sour. Words that make us scream. Words that make us feel the pain of fear itself tearing us from within. I find scary elements in almost every part of human life. It’s just a matter of how they are interpreted… I like to take a black canvas and fill it with a haunted house sketch of emotions and noise, and the lyrics themselves are part of that noise. Are you evil in real life or just big huggable teddy bears who like blood? A LOT! of blood. I would say we are both super nice guys in real life. This art is fiction and we don’t live in pure evil though we do like the idea of it. We just love the dark side and love making people scream and feel terror every now and then, but without some good humor to go alongside. I’m a mostly comedic guy in all reality. Never take too many things too seriously and for sure never push anything on anyone. Eddie is one of the most social dudes I know. Everywhere we go someone stops him to say hows it going… so I guess that shows you that side of who we are. 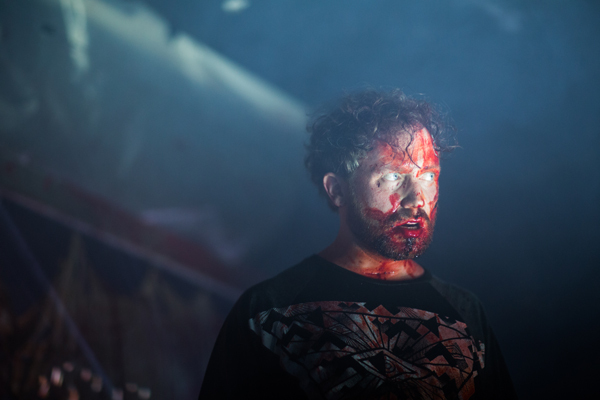 Your music video for “Emlyn” is basically terrifying. Where did the concept come from? What was the shoot like? And where are the bodies hidden? Your on stage performances are really intense and theatrical. What are you trying to convey to the crowd and do you ever scare yourself? And should people bring moist towellettes or does the blood just stay on you? 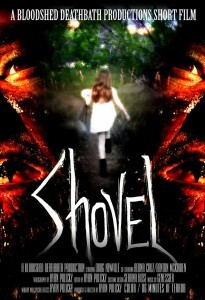 There’s a rumor that you have finished a new music video which is actually a short horror film called Shovel. What can you tell us about it? From 1 to 10 how scary is it? And same scale how bloody? Yes this is the truth! Rather than taking the typical approach of making a music video, we have taken two of our most atmospheric tracks and used them as score for a Bloodshed Deathbath Productions short film. It’s a super psychological and terrifying tale about this guy with a massive, torn to shreds shovel. But it’s a bit deeper than that and I can’t go into a ton of details without spoiling it. All we can say is the pairing was beautiful. The imagery is super dark and weird, and the songs fit it just right. We can’t wait for people to see it! On a scale of 1-10 it’s not just a 9.99 because of the blood, but also because of the mind numbing terror it brings. Should there be a spring Halloween? And, if so, how do we as a society make that happen? Halloween is all day, every day. I often find myself bored of the real Halloween, just because why do we need to be told when to be scary? We should always be scary, and always love scaring, and not feel weird about it because it’s “out of season”. I’m ready to dunk my head in a bunch of blood right now just to prove it, but alas I just did that a few hours ago for another horror film titled “Motel London Three”. Will you be writing any new songs in the near future? Of course! We need to finish a new album we started last summer, and I’ll do whatever it takes to make it happen. I have a few more terrifying tales to tell via music making, and I’m for sure ready to spill my guts! 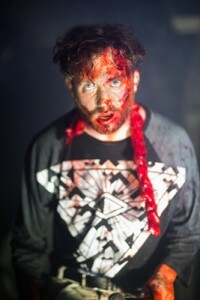 Visit bloodsheddeathbath.com or latenightweeknight.com for details on the next scary things we come up with. Join us!